Whoever is not satisfied with their amp alone, may look to run direct. The Geneva Amp Sim replicates the oft-sought after tones of the Vox AC30. 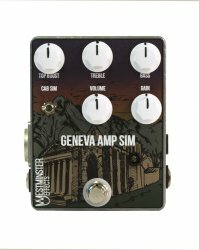 It is usable as an overdrive, but it shines with its switchable cabinet simulator and XLR out, which makes it perfect as an analog option for running direct and an inexpensive option for running stereo. Measurements: 4.7" x 3.6" x 1.5"
Volume - Controls the output volume. Gain - Controls the amount of gain in the circuit, just like an AC style amp. Top Boost - Instead of a different channel, dial in a blend between normal and the revered Top Boost channel. Treble - A straightforward treble control: To the right boosts treble; to the left cuts. Bass - A straight forward bass control: To the right boosts bass, to the left cuts. Cab Sim - If using as a DI, flip the switch tot he left to engage the speaker simulation. The switch on the side? - This is a ground lift switch. If you have a ground loop, flip the switch up/away from you. 9V Center Negative - Using anything else will ruin your pedal and VOID THE WARRANTY. Consumes 12mA.